Electric cars are finally becoming more a reality, between the Nissan Leaf, the Chevy Volt (though the Volt is cheating), and the Tesla Roadster, we’re seeing more and more places starting to build electric cars for the consumer market. Of course, the biggest problem with the electric vehicle, though they’ve been around for 100 years, is carrying enough juice to get from place to place. Just two months ago, DC got its first public charging station, and today, DC got its first private charging station, in the swank apartment building at 425 Mass Ave NW. The apartment complex run by Equity Group added the first of what they hope is many Coulomb ChargePoint stations supplied by Car Charging Group which will support two cars in special spaces in their garage. The ChargePoint units run $1,000-$2,000, and most garages that have a single ChargePoint can easily expand to add 8-10 stations without significant cost. While they haven’t yet planned for that many at 425 Mass Ave, they’re hoping to see an uptick of electric car purchases by their residents in the coming years. We spoke with one resident who’d happened upon today’s grand unveiling and she was incredibly positive, both about the building, and about the future of electric vehicles. A law student at Georgetown University, she was ecstatic at the idea of one day owning a Tesla and using the charging station as soon as she’s paid off her student loans. A charge from one of the ChargePoint stations will run you up to $5 (if your battery is mostly drained) to as little as $0.50 for just a little juice [Per our commenter below, this may not be correct pricing. We've asked for clarification from Car Charging group, as the prices above are just for the power, not for its distribution - Editor]. Currently, most electric cars have a range under 300 miles, which is comparable to the gas mileage I get out of my Jetta. Of course, a tank of gas runs me close to $40, so the idea of being able to fill up for a scant $5 has me thinking there’s something to these beasties. On hand to demonstrate the electric cars was Tesla Motors’ Shaun Philips, who offered free test rides to all of us, as well as limitless information about their Roadster product. Sure, that sports car might retail at $109,000 (look for a DC dealership at 1050 K Street in the not-too-distant future), but its regular maintenance cycle and fuel costs were far smaller than my hydrocarbon-burning Jetta. Not enough to make up the five-times-difference-in-cost, but hey, a guy can dream, right? While the ChargePoint at 425 Mass Ave is for private use only at this time, they are planning a future public garage option for the area, and at that time it would be available to the public. 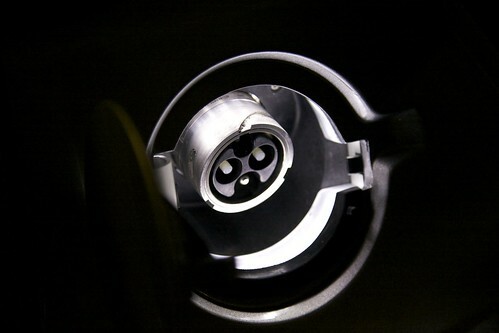 So, if you’re plotting an electric car, give the guys at Equity a look. They’re right up your alley. Of course, if you can afford an electric car, you can probably afford the cadillac rents (starting at only $1600 for a studio, and $3,200 for a 2BR!) at 425 Mass, so at least they know their audience well. So how long does it take to “fuel up” a full battery? On the 220V charger, from no battery, it takes about 8 hours to fill. Most charges will be less than that. I think the company that installed the charger estimated it would cost $3.50/hr at the 220v speed. 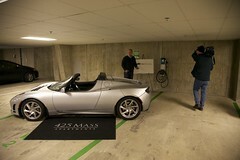 A Tesla Roadster might take up to 7 hours at that speed if the battery is almost dead. That’s about $25 for a full battery (about 200 miles on the Roadster). The “under 300 miles” figure is misleading, as it might lead people to think that electric cars have a range which is close to that number. An expensive electric (like a Tesla), might have a 200 mile range, but a more realistic number is 100 (Nissan Leaf) or even 40 (Chevy Volt). FYI, my ’93 Civic Hatchback has a 500 mile range under best conditions (spring or fall highway driving), and it’s never less than 400 under worst conditions. Spot on with this write-up, I really suppose this web site needs much more consideration. I’ll in all probability be once more to read far more, thanks for that info.